Two years ago, I interviewed a widow in her 80s who was cheated of her flat and later abandoned in a hospital by her son. He promised to take care of her after he took hundreds of thousands of dollars from the sale of her four-room flat. But he disappeared after checking her into a hospital for a cataract operation. He left her to fend for herself with just $1,000, her clothes and her identity card. Destitute, frail and without any other kin to live with, she was sent to a shelter for the abused elderly. What I remembered most from the interview with her was this: A part of her believes her son will come back for her one day. The last time I checked, at the end of last month, she was still living at the shelter, still hoping that her son would show up. Few elderly people seek help, as they fear getting their offspring into trouble with the law and that their children will sever ties with them if they report the abuse... But it is this reluctance to speak out and seek help that fuels the abuse. Abusers will continue their bullying if they think they can get away with it. Social workers say such cases, where seniors have been financially abused or exploited by their children or other loved ones, are increasingly common. Some, like the widow, were tricked or talked into selling their flats and giving the proceeds to their children. But they were left high and dry when their children went back on promises to house and care for them. Others asked their children to help them manage their finances, but discovered, to their horror, that their offspring had wiped out their life savings. And some were regularly threatened, beaten or confined at home if they did not give in to their children's demands for money. There are cases of adult sons, often jobless or addicted to some vice, asking for between $10 and $50 every few days. No one can put a finger on how common such cases are, for there are no prevalence studies on elder abuse in Singapore. But a 2014 study by Trans Safe Centre, a charity that specialises in tackling elder abuse, showed about one in three cases involved a senior who had been financially abused. Its research examined 93 cases of elder abuse handled by its social workers. There is a growing body of research in the United States into what commentators call "pre-grave robbing". 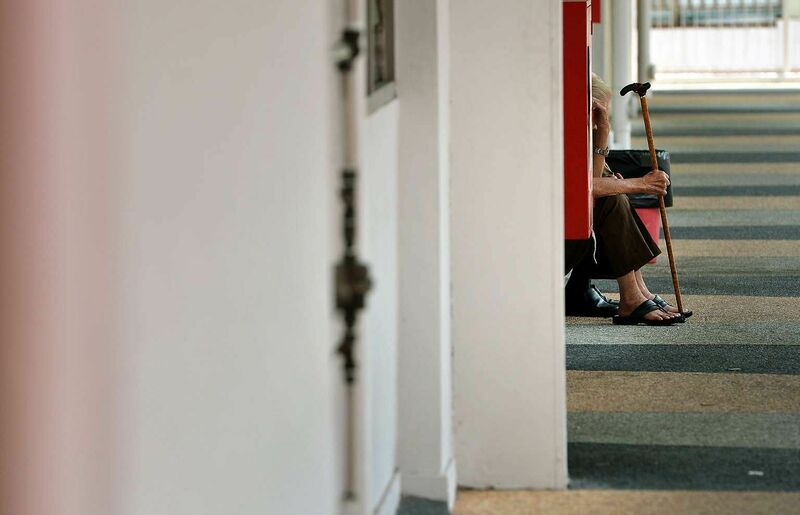 Studies there have consistently found that financial abuse is among the most common form of abuse suffered by the elderly, but it remains under-recognised as a problem and is under-reported. A widely cited nationally representative study of nearly 6,000 Americans aged 60 or older found that one in 20 had been financially abused by a family member in the previous year. It was done by researchers at the Medical University of South Carolina. Another large-scale study of over 4,000 seniors in New York state found that most cases of financial abuse were not reported. Only an estimated one in 44 cases was reported to social services, law enforcement or a legal authority. The study was conducted by the New York City Department for the Ageing and its partners. In Singapore, social workers say the reported cases are just the tip of the iceberg. Few elderly people seek help as they fear getting their offspring into trouble with the law and that their children will sever ties with them if they report the abuse. They also feel a lot more vulnerable being in the winter of their lives: weakening in all senses of the word, and growing increasingly dependent on their family. But it is this reluctance to speak out and seek help that fuels the abuse. Abusers will continue their bullying if they think they can get away with it. Studies show that in abusive relationships, the abuse gets worse and more frequent over time. If you do nothing, the abuse will not go away - it will get worse. It is crucial to help victims break their silence about the terror they endure at home. Seniors have to be educated that abuse - whatever the form - is not acceptable. And everyone - from loved ones to social workers to government agencies - has to play a part in encouraging the elderly to seek help to stop the abuse. It is crucial to note that abusive children, apart from eyeing their parents' money, tend to use violence, harassment or intimidation to get their way. Take, for instance, those who regularly demand money from their parents. If there is a first time, chances are, there will be a second. Demands for money become a habit; threats and the use of violence become a vicious circle. If seniors seek help, social workers can be roped in to tackle the underlying problems - whether they stem from mental illness, addiction or chronic unemployment - that led to the financial abuse in the first place. Seniors also have to be educated about how to better protect their finances from possible abuse. Currently, there is a network of agencies - such as the police, social service agencies that specialise in tackling family violence, and hospitals - that come together to better manage family violence cases. It would be helpful to pull more partners, including the Housing Board, banks and lawyers, into the National Family Violence Networking System, and come up with multi-disciplinary approaches to tackle the financial abuse of seniors. Abuse is very much a hidden problem among the elderly population now. But we cannot allow the ill treatment to come to light only when a parent is grievously injured or left destitute and homeless.